Citation Information: J Clin Invest. 2012;122(8):2741-2748. https://doi.org/10.1172/JCI60325. Research on the pathogenesis of asthma has traditionally concentrated on environmental stimuli, genetic susceptibilities, adaptive immune responses, and end-organ alterations (particularly in airway mucous cells and smooth muscle) as critical steps leading to disease. The focus of this cascade has been the response to allergic stimuli. An alternative scheme suggests that respiratory viruses and the consequent response of the innate immune system also drives the development of asthma as well as related inflammatory diseases. 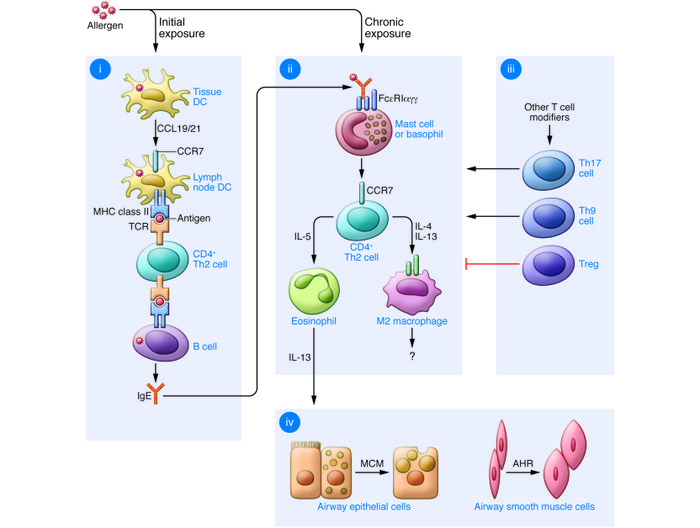 This conceptual shift raises the possibility that sentinel cells such as airway epithelial cells, DCs, NKT cells, innate lymphoid cells, and macrophages also represent critical components of asthma pathogenesis as well as new targets for therapeutic discovery. A particular challenge will be to understand and balance the innate as well as the adaptive immune responses to defend the host against acute infection as well as chronic inflammatory disease. Immune pathways leading to allergic lung disease. (i) Initial allergen exposure leads to uptake by lung conventional DCs and their migration to regional lymph nodes using CCL19/21-CCR7 interactions. In the nodes, DCs regulate MHC class II–dependent generation of CD4+ Th2 cells and consequent B cell (and, in turn, plasma cell) production of allergen-specific IgE. (ii) Chronic allergen exposure causes IgE cross-linking and FcεRI signaling, leading to activation of mast cells (and likely basophils and other cell types), with consequent recruitment of Th2 effector cells to the airway. Th2 cell production of IL-4 and/or IL-13 leads to alternatively activated macrophagedifferentiation, while IL-5 generation leads to eosinophil accumulation and further IL-13 production in the airway. (iii) Additional T cell subsets that regulate the allergic response include Th17, Th9, and Tregs that may influence the Th2 response and may act independently of this response as well. (iv) IL-13 (as well as other cytokines) drive mucous cell metaplasia (MCM) and airway hyperreactivity (AHR) that are characteristic of allergic asthma. Modified with permission from the American Journal of Respiratory Cell and Molecular Biology (140).